David Montenegro, the leader of the Red Arrows sat down with The Red Bulletin to talk about why, with just metres separating you in the air, faith in your fellow pilots is absolutely key. 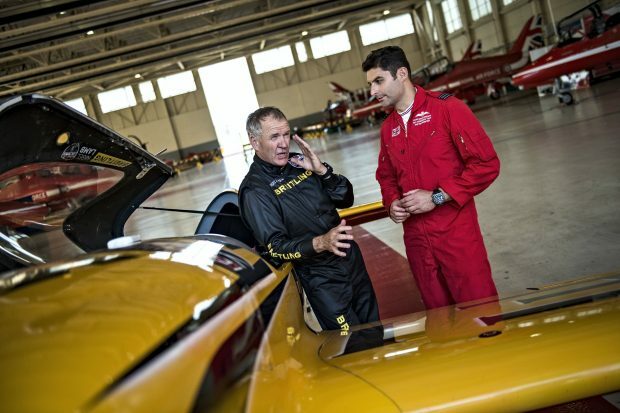 RAF Squadron leader David Montenegro is routinely referred to by his call sign: Red One. In the Red Arrows, he flies at the head of the formation, guiding it to where it needs to be. His is a multi-faceted job: mentor, training officer, manager – and pilot. The squadron, he says, functions on trust and mutual respect, though these aren’t given freely. The Red Bulletin: You lead the formation. What exactly does that entail? RB: Do you communicate much in the air? DM: Constantly. Our displays are almost scripted, and every manoeuvre is done on my command. It’s about getting the timing right, listening to my voice; there’s a very deliberate cadence. It’s like I’m narrating. RB: Do Red Arrows pilots trust each other automatically? DM: No, it’s not a case of selection bringing instant appreciation. Trust starts to build during our training season. The most important part of selection is character assessment: you want those who are confident, but not over-confident; who accept informed criticism and can talk about their issues. By the end of training, having seen the new pilots work on their weaknesses and develop their skills, you go into the display season confident that they’ll respond to tough situations in the correct way. RB: Are there degrees of trust? DM: Many. I think the most crucial relationships are between the team members and the leader, and then between the Synchro Pair. We begin the training season in small groups and build up to the full formation, but for four months we barely see the Synchro Pair. They share an office and work up their routine, honing the raw flying ability they’ll need. Synchro 2 is a second-season pilot who will become Synchro leader in his third year and be responsible for choosing a partner from the first-year pilots. It would be… wrong for me to become autocratic and make that decision; it must be the Synchro Leader’s choice. RB: You fly to venues with the Circus [technical support team] sitting in the back seats. Is that unusual? DM: In the fast-jet environment, yes. But it’s a close relationship. You have implicit trust in them to prepare the aircraft, because you know the training they’ve been given by the RAF and you know their character. RB: Does being a military squadron make that process easier to manage? DM: I think our framework allows us to get jobs done very well and quickly. We understand each other’s background. The 21-year- old senior aircraftman appreciates where I’ve come from, and I know the quality of training he’s had and how he’s got where he is. That helps. I think the relationship is strong because there is a natural hierarchy in the service. I can ask for a task to be done and know it’ll be done a certain way and on time because this is what we do in the RAF. But my massive caveat is that simply wearing rank doesn’t engender trust. It always has to be earned. Find the full article on RedBulletin.com here.